2. Ivermectin Spot-On Drops 0.1%. (Pharmaq Brand) 10ml. 4. Ivermectin Spot-On Drops 1%. (Pharmaq Brand) 10ml. 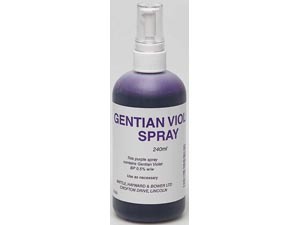 Battles Gentian Violet Spray is a non aerosol purple antiseptic spray containing 0.5% w/w gentian violet. Anti-fungal spray for minor wounds. Suitable for use on sheep, cattle, goats, horses, pigs and poultry. Stains treated area for identification. In poultry may also be used to help prevent aggressive pecking.